If there's anyone out there who has given up on broccoli rabe due to it's tendency to be bitter unless you know how to expertly coax it into relative sweetness (which can be a very hit-or-miss situation), I've got news for you. Spring broccoli rabe is a whole new ballgame, sister. I've taken to picking up bundles of the stuff at Lani's Farm at the Union Square greenmarket every weekend, and then missing it acutely the second I've run out. Technically, the broccoli rabe that you'll find at the markets right now isn't a spring vegetable, but one that is "wintered over," meaning that it grew out of what was left in the ground at the time of last fall's final harvest. It's sweeter and milder than the kind harvested at other times of the year, which makes all the difference in the world. Usually, with broccoli rabe, you'd have to tame the bitterness by going through the annoying process of boiling it for a minute and then dunking it in a bowl of ice water before getting to the sautee part. But because this spring version of the healthy veggie is so much sweeter, that step becomes obsolete. Time saver! Cook garlic in oil in a 12-inch nonstick skillet over moderate heat, stirring occasionally, until garlic is fragrant, about 2 minutes. Add broccoli rabe and cook, tossing to coat with oil, until heated through, 3 to 5 minutes. 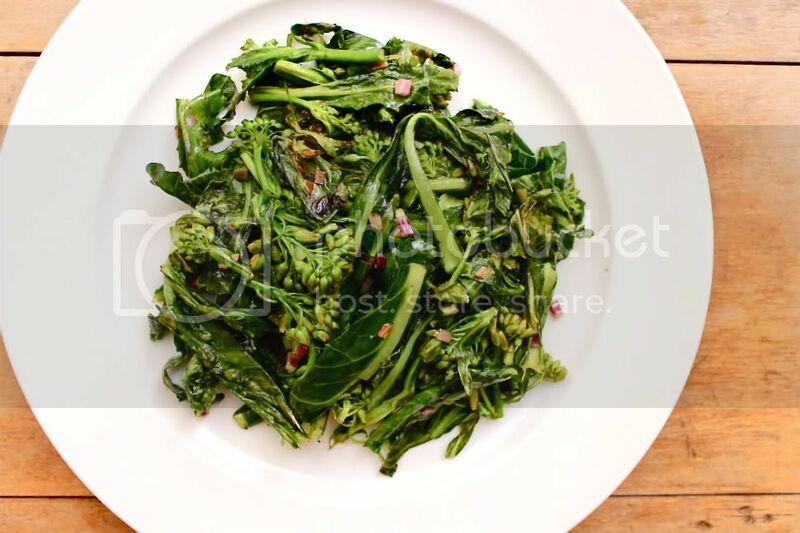 Toss broccoli rabe with a bit of salt to taste. This looks absolutely delicious! It'll definitely revive my love for broccoli!